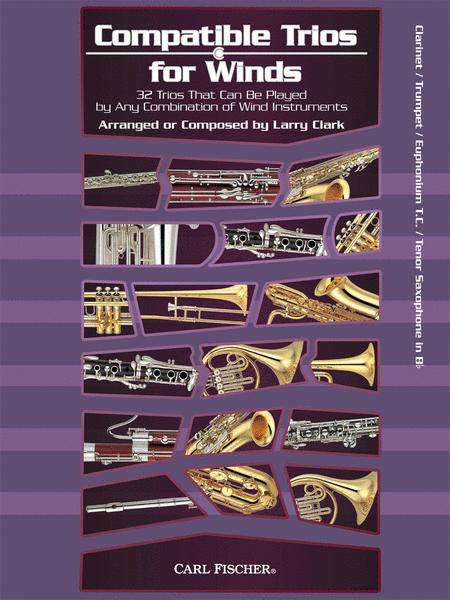 32 Trios That Can Be Played by Any Combination of Wind Instruments. Composed by Larry Clark. Arranged by Larry Clark. Compatible Trios for Winds. Softcover. With Standard notation. 48 pages. Carl Fischer #WF00129. Published by Carl Fischer (CF.WF129). This collection contains 32 trios in a variety of styles from classical to folk, and includes some new original works as well. Each piece is playable by any combination of three wind instruments. 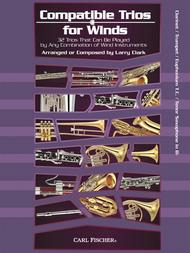 Trios are a great way to learn how to play in a chamber music setting, and this unique collection gives players the opportunity to do it with anyone else that plays a wind instrument, making for an almost limitless combination of instruments. Compatible Trios for Winds is especially useful in a school setting where students are eager to play music with friends. The flexibility of these trios makes them a must-have for any wind player. Includes tunes such as ?The Irish Washerwoman,? Brahms? ?Hungarian Dance No. 5,? Larry Clark's original ?Harvest Moon,? and more.